CANTON, Mass., (February 25, 2015) – Dunkin’ Donuts, America’s all-day, everyday stop for coffee and baked goods, and WhiteWave Foods (NYSE:WWAV) ("WhiteWave"), a leading consumer packaged food and beverage company in North America, today announced three new flavored at-home Dunkin’ Donuts Coffee Creamers. The new flavors include Vanilla, Hazelnut and Caramel, and all are now available in the refrigerated section at select grocery outlets and club stores nationwide. Dunkin’ Donuts entered into a partnership with WhiteWave to manufacture and distribute Dunkin’ Donuts Coffee Creamer in January 2014. Dunkin’ Donuts Coffee Creamers are sold in 32-ounce resealable bottles. 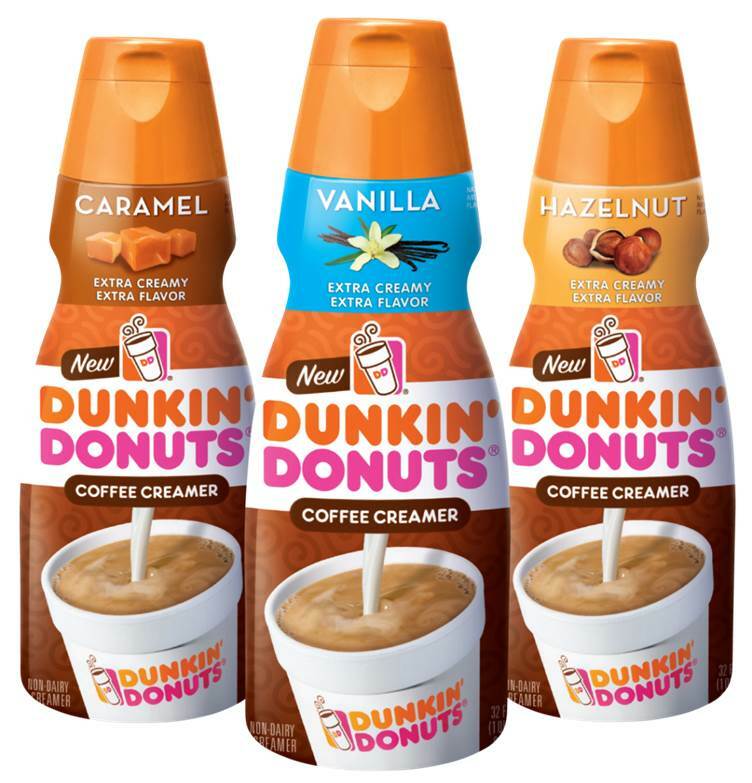 The new Vanilla, Hazelnut and Caramel Dunkin’ Donuts Coffee Creamer flavors join the existing lineup of Dunkin’ Donuts Original, Fat-Free and Extra Extra items. To learn more about Dunkin’ Donuts Coffee Creamers, visit www.dunkincreamer.com. The WhiteWave Foods Company is a leading consumer packaged food and beverage company that manufactures, markets, distributes, and sells branded plant-based foods and beverages, coffee creamers and beverages, premium dairy products and organic produce throughout North America and Europe. The Company also holds a 49% ownership interest in a joint venture that manufactures, markets, distributes, and sells branded plant-based beverages in China. WhiteWave is focused on providing consumers with innovative, great-tasting food and beverage choices that meet their increasing desires for nutritious, flavorful, convenient, and responsibly-produced products. The Company’s widely-recognized, leading brands distributed in North America include Silk® and So Delicious® plant-based foods and beverages, International Delight® and LAND O LAKES®* coffee creamers and beverages, Horizon Organic® premium dairy products and Earthbound Farm® organic salads, fruits and vegetables. Its popular plant-based foods and beverages brands in Europe include Alpro® and Provamel®, and its plant-based beverages in China are sold under the Silk® ZhiPuMoFang brand. To learn more about WhiteWave, visit www.whitewave.com.